This is the first installment of a new series of articles on Moscow nightlife. We go back to the now distant past, back to those dark days when Perestroika was only just over, but when old soviet values had already become meaningless. The new club movement was about to turn people’s ideas of what clubs, and to a certain extent life in general are all about upside down. What did Moscow club life look like in those days? Muscovites and residents of St. Petersburg still cannot decide which of these two competing cultural centers was the first to embrace what came to be known as nightlife. In both cities there was no shortage of private clubs in the early 1990s. Most of them, however, would open their doors only for members and the friends of the owners (and sometimes friends of these friends too). The first clubs were more often than not private parties; mostly closed for outsiders. In the very early days, most of them were non-commercial, created only for the guests of whoever hosted the event. “Fontanka 145” was one of the most famous and remarkable places in St. Petersburg. It was founded in 1990 by brothers and “activists” (at least that is what they called themselves) Alexei and Andrei Haas. Andrei describes those days in his book “Korporatsiya Schastya”(Corporation of Happiness, 2006). He writes that he and his brother found “Fontanka 145” accidentally: it was a deserted apartment with no furniture, visited only by occasional tramps. The brothers transformed it into a fashionable place with brilliant internal design. It became a magnet for all St. Peterburg’s bohemian population: artists who didn’t fit into the post-soviet mainstream, poets and some students. The club become famous overnight. But it didn’t exist very long. The Haas brothers and some of their close friends moved on and founded a new club called Tanzpol (Dancefloor). This time they filled the former St. Petersburg planetarium with demonic and forbidden acid sound. 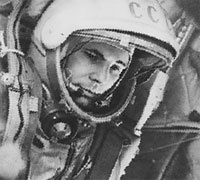 As Soviet cosmonauts were proclaimed loudly as heroes all over the USSR, there was a planetarium in almost every city or town. Soviet citizens ceremoniously visited these places to find out about the cosmos and renew their faith in the achievements of Soviet cosmonautics. When the Soviet epic myths headed for the Exit, the planetariums had fewer and fewer visitors. Tanzpol which opened in 1991, was one of the first places with techno, trance, house music and real DJs who played vinyl records; not just tape cassettes and bobinas (large size tape spools) as was previously the case at every disco. 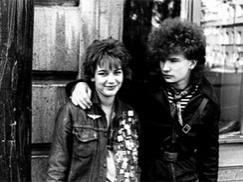 Those were days of true chaos, post-soviet disorder and romance with no money in your pockets. After their success in St. Petersburg, the Haas brothers, their partner and DJs Ivan Salmaksov and Eugeny Birman decided to hold their first rave party in Moscow: “Gagarin-Party.” They were tired of amazing but a little provincial St. Petersburg, and eager for new achievements and adventures. But what was the capital like in those days? The first Moscow clubs were not as secret and progressive as St. Peterburg’s jives. They were often arranged for the rich, for former members of the communist party. Criminals also often met in those first generation of Moscow clubs, such as “Arlekino” and some others. The floors of these clubs were occasionally splattered with blood, as those unfriendly looking bald-headed men held shootouts on the dance floors. Nuzhdin remembers the first clubs organized in Moscow, in former DK (Dom Kultury – multi-functional soviet entertainment centers, where citizens used to be able to watch films, dance, do sports and follow a hobby, all in one place). When the first clubs were opened, the arm-chairs were ripped out, and the podiums where screens were, were used as stages. The DKs were huge buildings, meant to promote Soviet culture on a local level, however at the beginning of nineties they were abandoned and looked pretty miserable. “Palace” was one of these former DK with no interior design, a big stage and bad, echoing sound. Nevertheless, it became one of the first legendary clubs in Moscow at the time. Back to our heroes in St. Petersburg who decided to bless their Moscow brothers and sisters with something new. The “Gagarin Party;” the first legendary rave that activists from the Northern City - Ivan Salmaksov, Eugeny Birman and the Haas brothers was held in Moscow in 1991. Mighty raves like this made the organizers neither rich or famous, and one of them, Ivan Salmaksov, disappeared in mysterious circumstances some years later; no body was found, but his apartment was flayed with blood. 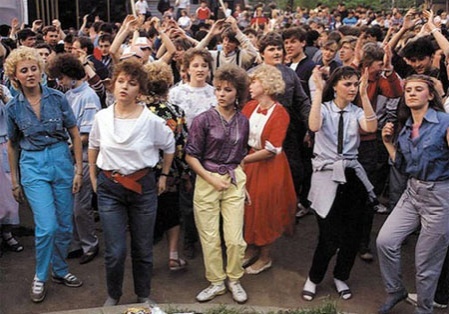 Anyway, these parties were the pioneers of club history in Moscow. Then in 1992-1995, Jazz-cafe, Penthouse, Nightflight , 2x2, Ermitazh, Bely Tarakan (White Roach), Titanik and Utopia appeared. But that’s the topic of our next installment of Moscow club history.